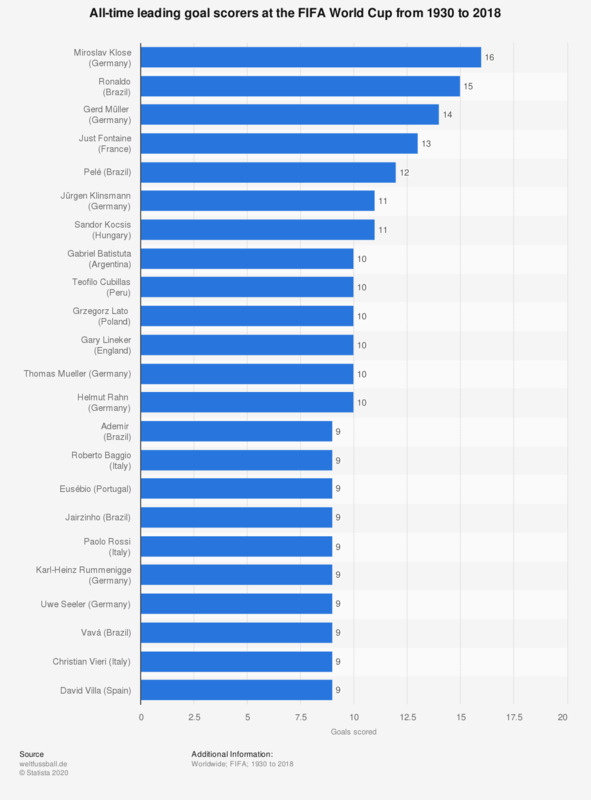 This graph depicts the players with the most goals scored at the FIFA World Cup from 1930 to 2018. The German striker Miroslav Klose is the leading goal scorer at FIFA World Cup tournaments, having scored a total of 16 goals across 4 World Cups. Klose scored his first three goals in his World Cup debut at the 2002 World Cup in South Korea & Japan in Germany's first group match against Saudi Arabia. He scored his sixteenth and record-breaking goal in Germany's semi-final matchup with Brazil at the 2014 World Cup. Along with Pelé and Uwe Seeler (who have 12 and 9 World Cup goals respectively), Klose is one of only three players to have scored at least one goal at four different World Cups. Klose is also the only player to have scored at least four goals in three separate tournaments. Following the retirement of Miroslav Klose and David Villa (9 World Cup goals) after the 2014 World Cup in Brazil, of the list only Thomas Mueller still plays football internationally. In his first World Cup in 2010, Mueller ended as joint top goal scorer of the tournament and winner of the Golden Boot with five goals and three assists. Having scored a further 5 goals at the World Cup in 2014, earning him the Silver Boot behind Colombia’s James Rodriguez, Mueller became only the third player (after Teófilo Cubillas and Miroslav Klose) to score at least five goals in each of his first two World Cups. Germany is the nation with the most top goal scorers on the list with 7 players, followed by Brazil with 5. France’s Just Fontaine, ranked 4th on the list, holds the record for the most goals scored in a single edition of the World Cup, with all 13 of his World Cup goals coming in the 1958 tournament. This included a hat-trick against Paraguay in the group stages and four goals in the Third Place Match against West Germany.